Hello from the Green Schools Committee!!! This year we are going to be working towards our Water Flag! I’m sure some of you know, last week the Committee went on a trip to Dublin for a meeting with other schools who are doing the water flag too! The purpose of the meeting was to discuss Saving Water. We talked about the fact that you should NEVER flush anything down the toilet except toilet paper. Everything else really messes up Irish Water’s filtration systems especially cotton buds. Also, we talked about how dual flush toilets are better than normal toilets. If you have a non- dual flush toilet you can fill a bottle with sand and put it into the water- filled part of the cistern, which makes the water level rise, so your toilets use much less water than they usually would. And always use showers instead of baths, but only for a max of five minutes. We will bring this to the school by doing water- meter checks and figuring out how many water-using appliances there are in the school. And yes, teachers, this includes the staffroom kettle! We will also be doing some water themed events, but the details have yet to be settled. We’re going to check the toilets for leaks. Watch this space! If you have any suggestions to help us earn our Water Flag this year please let us know! In Second Class we have been learning about the Water Cycle. There are three stages of the Water Cycle: Evaporation, Condensation and Precipitation. It has been interesting to learn about. Our favourite project was doing the Plate Water Cycles. We have all enjoyed it. 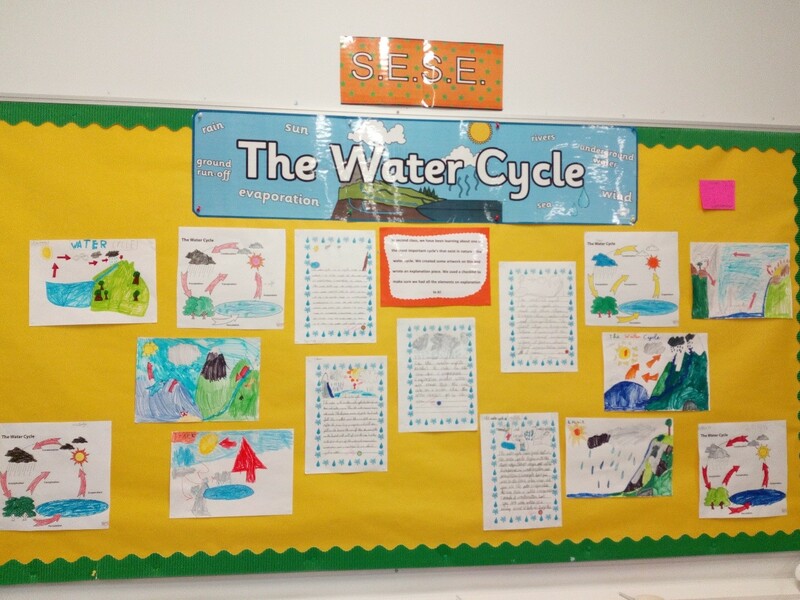 I really hope learning about the Water Cycle is important for helping us work towards our School’s Water Flag!